Презентация на тему: "An Opening Speech Dear Ladies and Gentlemen. The 4th Prize Award cycle has come to an end. 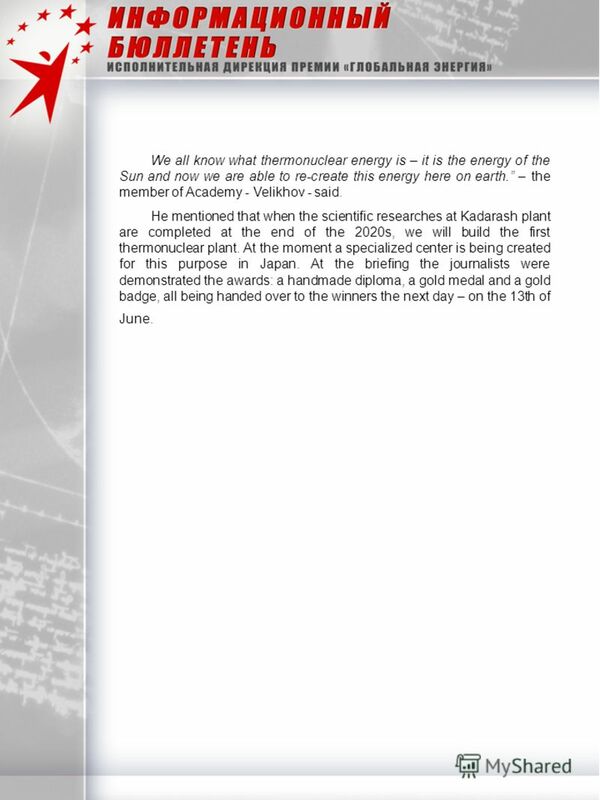 With all the confidence we can say that the Global Energy Prize.". Скачать бесплатно и без регистрации. 4 A number of speeches touched upon the legal basis for regulating foreign investments, ways of integrating into a single Europe and achieving macroeconomic stability. There were several sessions dedicated to the important role of the law in struggling against corruption and organized crime in the countries of Eastern Europe and Europe as a whole. The session «Demands for future regional cooperation in the energetic sector» was met with a peculiar interest of the participants. This was the only session with the key speaker appointed – Igor Lobovsky, Executive Director of the International Global Energy Prize. 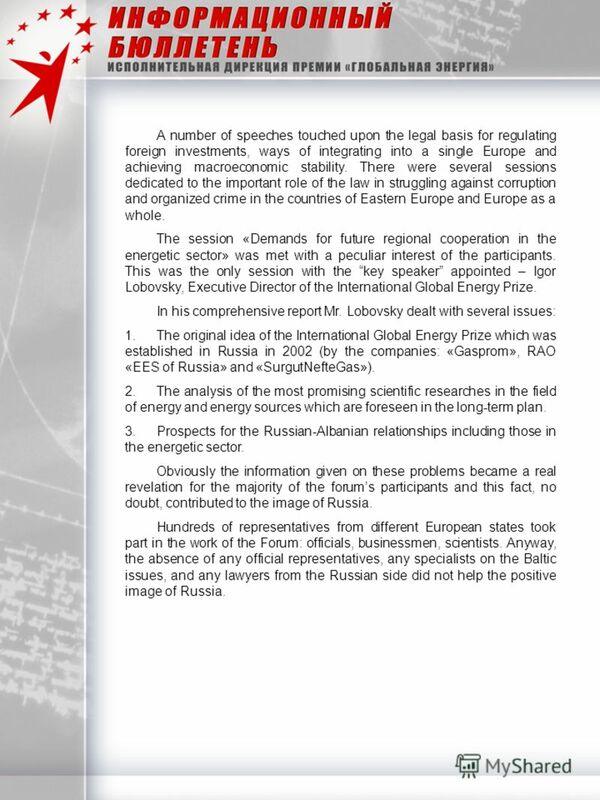 In his comprehensive report Mr. Lobovsky dealt with several issues: 1.The original idea of the International Global Energy Prize which was established in Russia in 2002 (by the companies: «Gasprom», RAO «EES of Russia» and «SurgutNefteGas»). 2.The analysis of the most promising scientific researches in the field of energy and energy sources which are foreseen in the long-term plan. 3.Prospects for the Russian-Albanian relationships including those in the energetic sector. Obviously the information given on these problems became a real revelation for the majority of the forums participants and this fact, no doubt, contributed to the image of Russia. Hundreds of representatives from different European states took part in the work of the Forum: officials, businessmen, scientists. Anyway, the absence of any official representatives, any specialists on the Baltic issues, and any lawyers from the Russian side did not help the positive image of Russia. 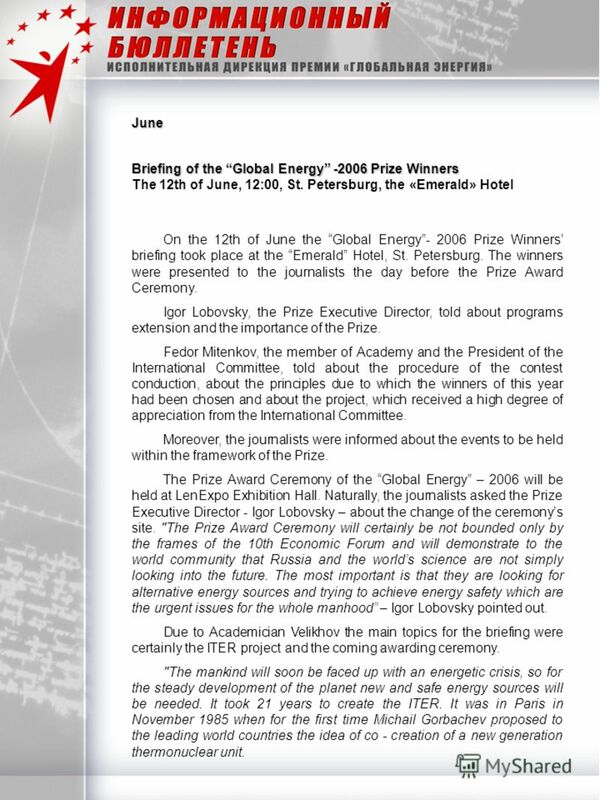 5 June Briefing of the Global Energy Prize Winners The 12th of June, 12:00, St. Petersburg, the «Emerald» Hotel On the 12th of June the Global Energy Prize Winners briefing took place at the Emerald Hotel, St. Petersburg. The winners were presented to the journalists the day before the Prize Award Ceremony. Igor Lobovsky, the Prize Executive Director, told about programs extension and the importance of the Prize. Fedor Mitenkov, the member of Academy and the President of the International Committee, told about the procedure of the contest conduction, about the principles due to which the winners of this year had been chosen and about the project, which received a high degree of appreciation from the International Committee. Moreover, the journalists were informed about the events to be held within the framework of the Prize. 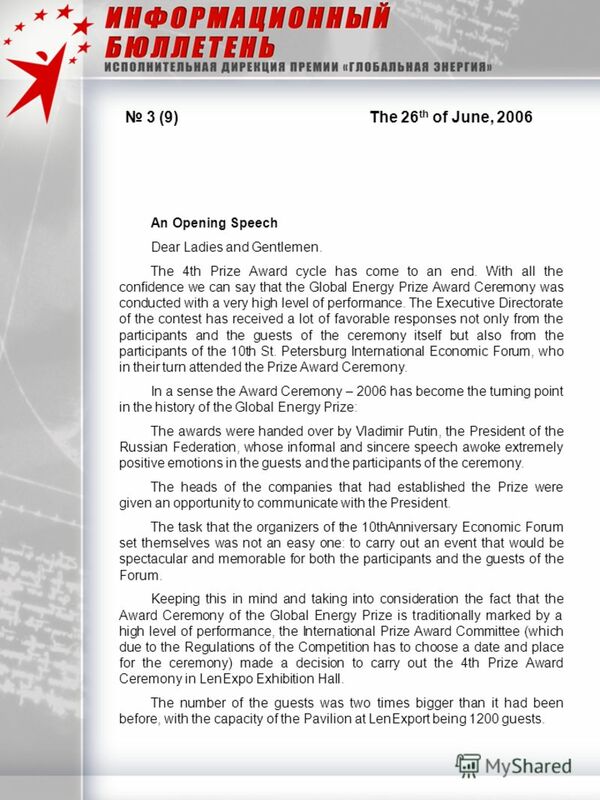 The Prize Award Ceremony of the Global Energy – 2006 will be held at LenExpo Exhibition Hall. Naturally, the journalists asked the Prize Executive Director - Igor Lobovsky – about the change of the ceremonys site. "The Prize Award Ceremony will certainly be not bounded only by the frames of the 10th Economic Forum and will demonstrate to the world community that Russia and the worlds science are not simply looking into the future. The most important is that they are looking for alternative energy sources and trying to achieve energy safety which are the urgent issues for the whole manhood – Igor Lobovsky pointed out. 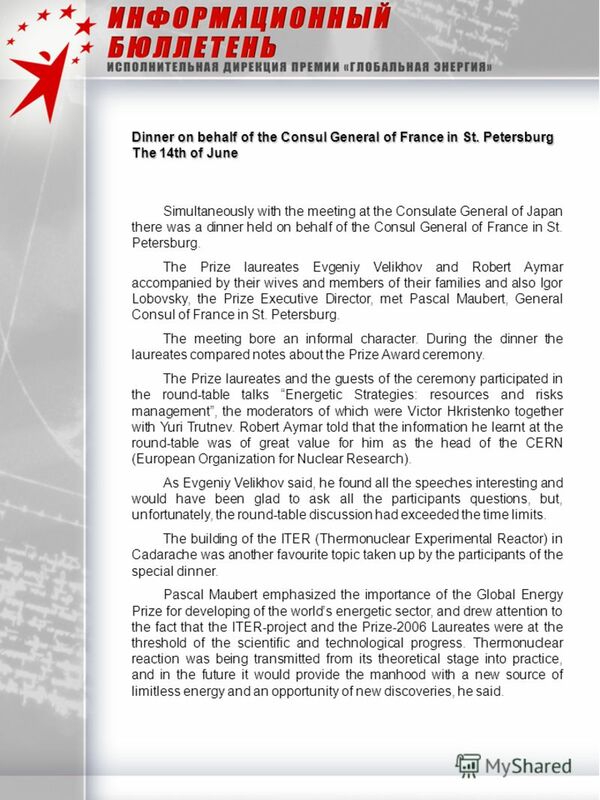 Due to Academician Velikhov the main topics for the briefing were certainly the ITER project and the coming awarding ceremony. "The mankind will soon be faced up with an energetic crisis, so for the steady development of the planet new and safe energy sources will be needed. It took 21 years to create the ITER. It was in Paris in November 1985 when for the first time Michail Gorbachev proposed to the leading world countries the idea of co - creation of a new generation thermonuclear unit. 6 We all know what thermonuclear energy is – it is the energy of the Sun and now we are able to re-create this energy here on earth. – the member of Academy - Velikhov - said. He mentioned that when the scientific researches at Kadarash plant are completed at the end of the 2020s, we will build the first thermonuclear plant. At the moment a specialized center is being created for this purpose in Japan. At the briefing the journalists were demonstrated the awards: a handmade diploma, a gold medal and a gold badge, all being handed over to the winners the next day – on the 13th of June. 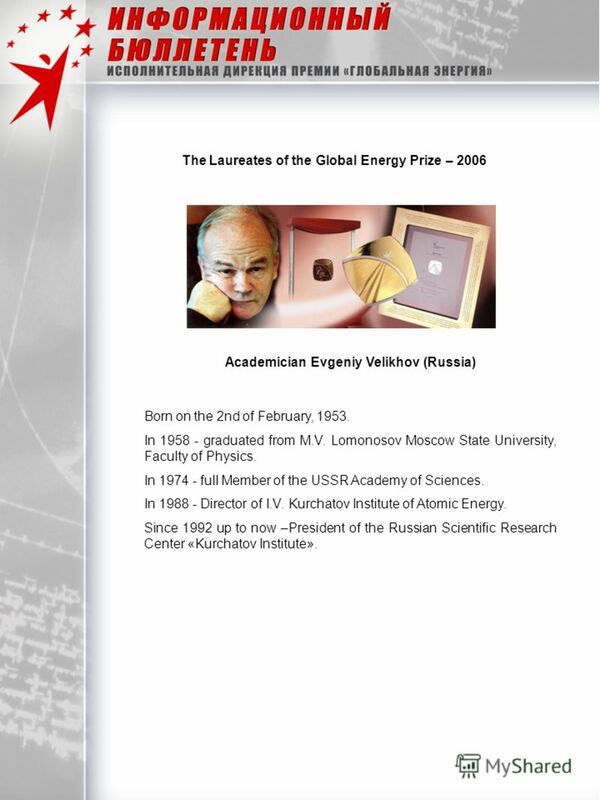 7 The Laureates of the Global Energy Prize – 2006 Academician Evgeniy Velikhov (Russia) Born on the 2nd of February, In graduated from M.V. Lomonosov Moscow State University, Faculty of Physics. In full Member of the USSR Academy of Sciences. In Director of I.V. Kurchatov Institute of Atomic Energy. Since 1992 up to now –President of the Russian Scientific Research Center «Kurchatov Institute». 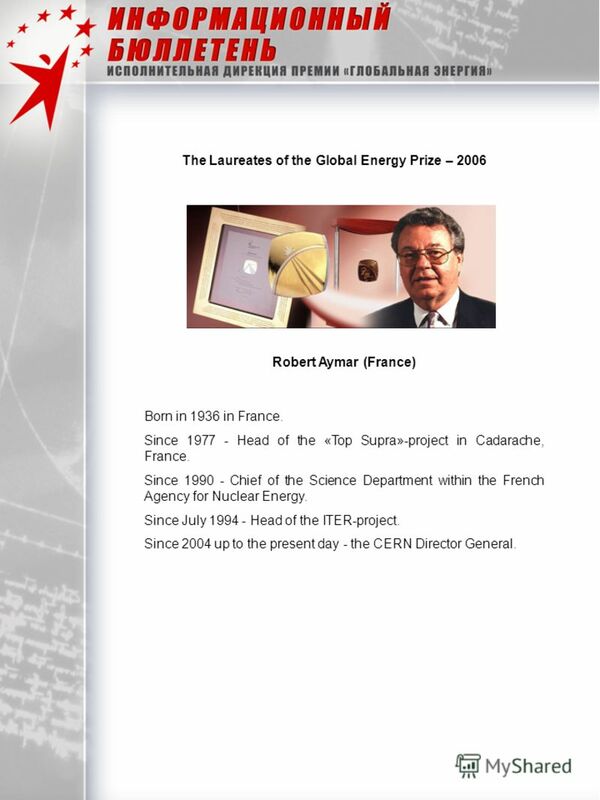 8 The Laureates of the Global Energy Prize – 2006 Robert Aymar (France) Born in 1936 in France. Since Head of the «Top Supra»-project in Cadarache, France. Since Chief of the Science Department within the French Agency for Nuclear Energy. Since July Head of the ITER-project. Since 2004 up to the present day - the CERN Director General. 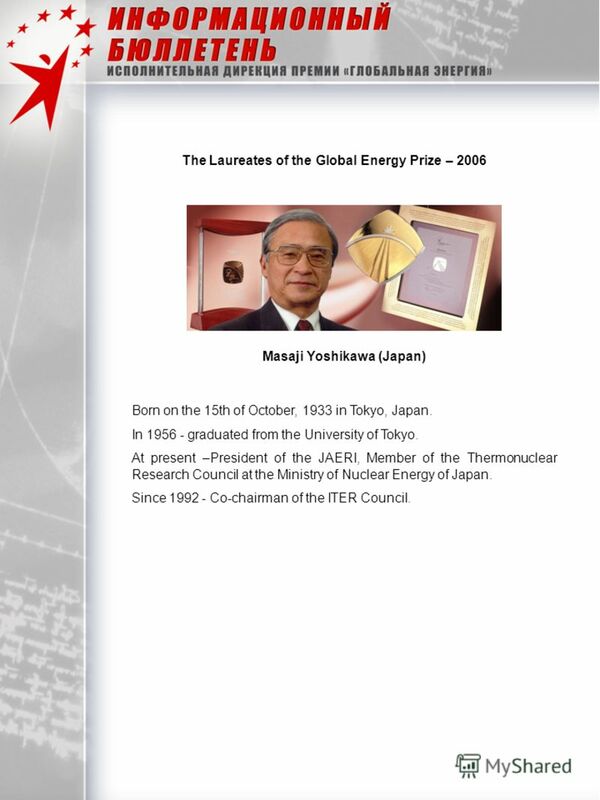 9 The Laureates of the Global Energy Prize – 2006 Masaji Yoshikawa (Japan) Born on the 15th of October, 1933 in Tokyo, Japan. In graduated from the University of Tokyo. At present –President of the JAERI, Member of the Thermonuclear Research Council at the Ministry of Nuclear Energy of Japan. Since Co-chairman of the ITER Council. 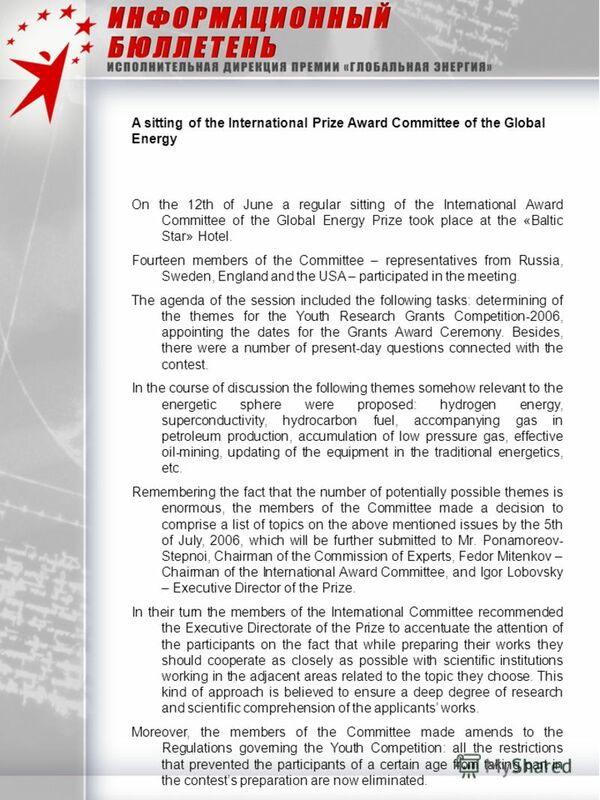 12 A sitting of the International Prize Award Committee of the Global Energy On the 12th of June a regular sitting of the International Award Committee of the Global Energy Prize took place at the «Baltic Star» Hotel. Fourteen members of the Committee – representatives from Russia, Sweden, England and the USA – participated in the meeting. The agenda of the session included the following tasks: determining of the themes for the Youth Research Grants Competition-2006, appointing the dates for the Grants Award Ceremony. Besides, there were a number of present-day questions connected with the contest. In the course of discussion the following themes somehow relevant to the energetic sphere were proposed: hydrogen energy, superconductivity, hydrocarbon fuel, accompanying gas in petroleum production, accumulation of low pressure gas, effective oil-mining, updating of the equipment in the traditional energetics, etc. 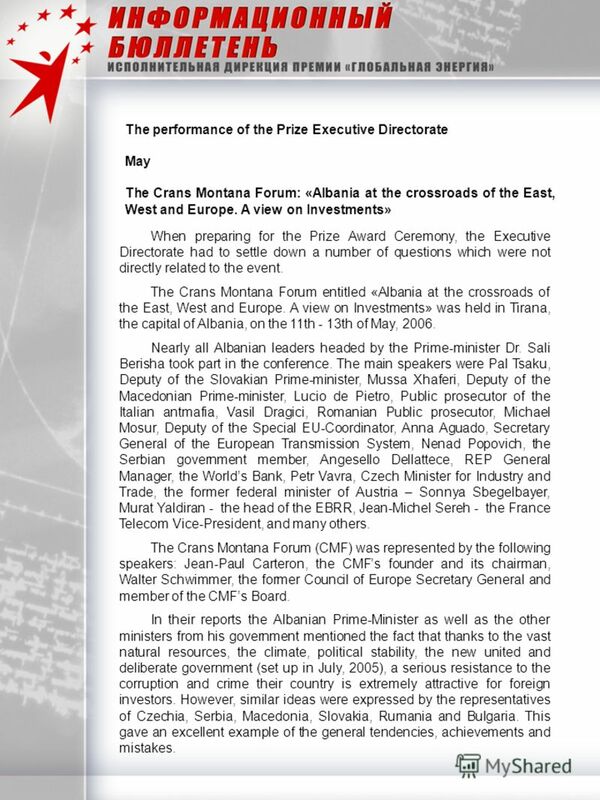 Remembering the fact that the number of potentially possible themes is enormous, the members of the Committee made a decision to comprise a list of topics on the above mentioned issues by the 5th of July, 2006, which will be further submitted to Mr. Ponamoreov- Stepnoi, Chairman of the Commission of Experts, Fedor Mitenkov – Chairman of the International Award Committee, and Igor Lobovsky – Executive Director of the Prize. In their turn the members of the International Committee recommended the Executive Directorate of the Prize to accentuate the attention of the participants on the fact that while preparing their works they should cooperate as closely as possible with scientific institutions working in the adjacent areas related to the topic they choose. This kind of approach is believed to ensure a deep degree of research and scientific comprehension of the applicants works. Moreover, the members of the Committee made amends to the Regulations governing the Youth Competition: all the restrictions that prevented the participants of a certain age from taking part in the contests preparation are now eliminated. 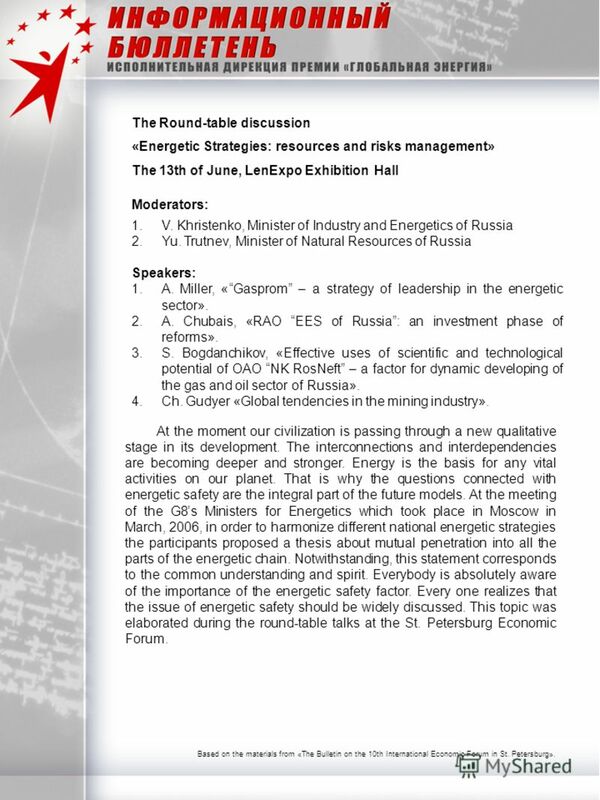 13 The Round-table discussion «Energetic Strategies: resources and risks management» The 13th of June, LenExpo Exhibition Hall Moderators: 1.V. Khristenko, Minister of Industry and Energetics of Russia 2.Yu. Trutnev, Minister of Natural Resources of Russia Speakers: 1.A. Miller, «Gasprom – a strategy of leadership in the energetic sector». 2.A. Chubais, «RAO EES of Russia: an investment phase of reforms». 3.S. Bogdanchikov, «Effective uses of scientific and technological potential of OAO NK RosNeft – a factor for dynamic developing of the gas and oil sector of Russia». 4.Ch. Gudyer «Global tendencies in the mining industry». At the moment our civilization is passing through a new qualitative stage in its development. The interconnections and interdependencies are becoming deeper and stronger. Energy is the basis for any vital activities on our planet. That is why the questions connected with energetic safety are the integral part of the future models. At the meeting of the G8s Ministers for Energetics which took place in Moscow in March, 2006, in order to harmonize different national energetic strategies the participants proposed a thesis about mutual penetration into all the parts of the energetic chain. Notwithstanding, this statement corresponds to the common understanding and spirit. Everybody is absolutely aware of the importance of the energetic safety factor. Every one realizes that the issue of energetic safety should be widely discussed. This topic was elaborated during the round-table talks at the St. Petersburg Economic Forum. Based on the materials from «The Bulletin on the 10th International Economic Forum in St. Petersburg». 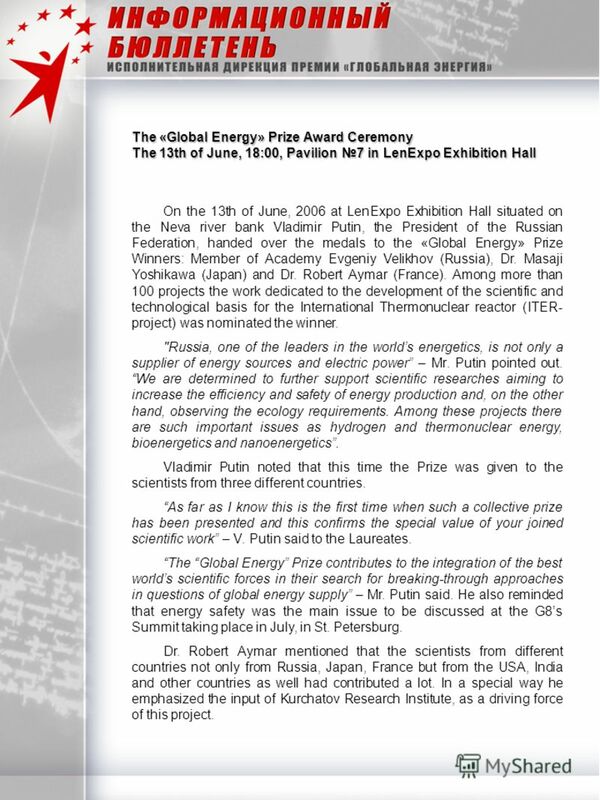 14 The «Global Energy» Prize Award Ceremony The 13th of June, 18:00, Pavilion 7 in LenExpo Exhibition Hall On the 13th of June, 2006 at LenExpo Exhibition Hall situated on the Neva river bank Vladimir Putin, the President of the Russian Federation, handed over the medals to the «Global Energy» Prize Winners: Member of Academy Evgeniy Velikhov (Russia), Dr. Masaji Yoshikawa (Japan) and Dr. Robert Aymar (France). Among more than 100 projects the work dedicated to the development of the scientific and technological basis for the International Thermonuclear reactor (ITER- project) was nominated the winner. "Russia, one of the leaders in the worlds energetics, is not only a supplier of energy sources and electric power – Mr. Putin pointed out. We are determined to further support scientific researches aiming to increase the efficiency and safety of energy production and, on the other hand, observing the ecology requirements. Among these projects there are such important issues as hydrogen and thermonuclear energy, bioenergetics and nanoenergetics. Vladimir Putin noted that this time the Prize was given to the scientists from three different countries. As far as I know this is the first time when such a collective prize has been presented and this confirms the special value of your joined scientific work – V. Putin said to the Laureates. The Global Energy Prize contributes to the integration of the best worlds scientific forces in their search for breaking-through approaches in questions of global energy supply – Mr. Putin said. He also reminded that energy safety was the main issue to be discussed at the G8s Summit taking place in July, in St. Petersburg. Dr. Robert Aymar mentioned that the scientists from different countries not only from Russia, Japan, France but from the USA, India and other countries as well had contributed a lot. In a special way he emphasized the input of Kurchatov Research Institute, as a driving force of this project. 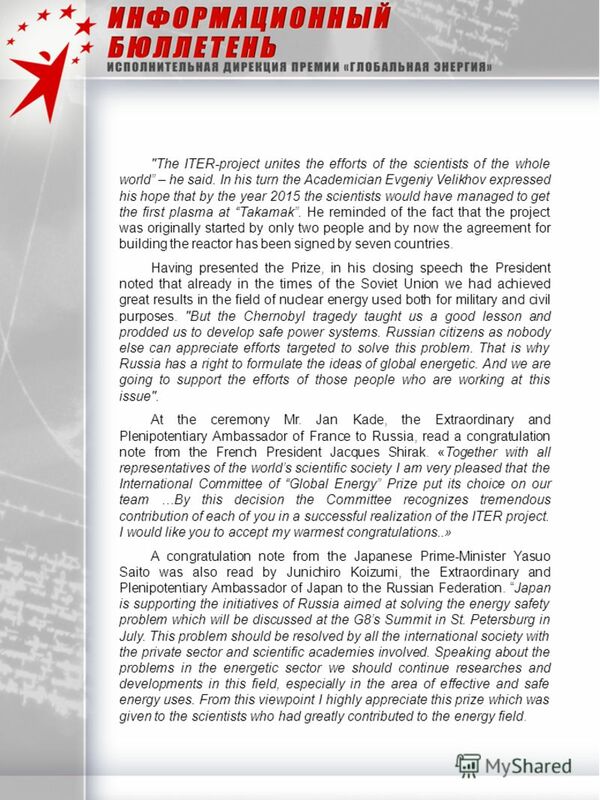 15 "The ITER-project unites the efforts of the scientists of the whole world – he said. In his turn the Academician Evgeniy Velikhov expressed his hope that by the year 2015 the scientists would have managed to get the first plasma at Takamak. He reminded of the fact that the project was originally started by only two people and by now the agreement for building the reactor has been signed by seven countries. Having presented the Prize, in his closing speech the President noted that already in the times of the Soviet Union we had achieved great results in the field of nuclear energy used both for military and civil purposes. "But the Chernobyl tragedy taught us a good lesson and prodded us to develop safe power systems. Russian citizens as nobody else can appreciate efforts targeted to solve this problem. That is why Russia has a right to formulate the ideas of global energetic. And we are going to support the efforts of those people who are working at this issue". At the ceremony Mr. Jan Kade, the Extraordinary and Plenipotentiary Ambassador of France to Russia, read a congratulation note from the French President Jacques Shirak. 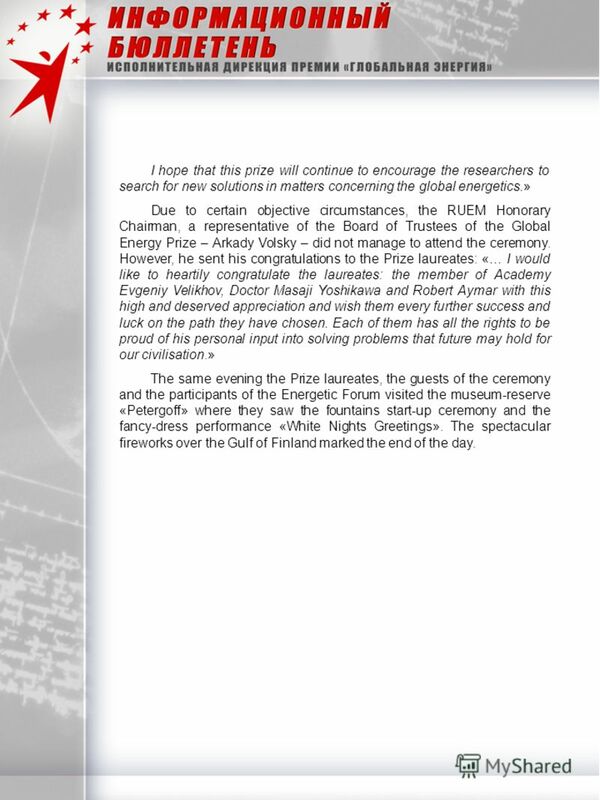 «Together with all representatives of the worlds scientific society I am very pleased that the International Committee of Global Energy Prize put its choice on our team …By this decision the Committee recognizes tremendous contribution of each of you in a successful realization of the ITER project. I would like you to accept my warmest congratulations..» A congratulation note from the Japanese Prime-Minister Yasuo Saito was also read by Junichiro Koizumi, the Extraordinary and Plenipotentiary Ambassador of Japan to the Russian Federation. Japan is supporting the initiatives of Russia aimed at solving the energy safety problem which will be discussed at the G8s Summit in St. Petersburg in July. This problem should be resolved by all the international society with the private sector and scientific academies involved. Speaking about the problems in the energetic sector we should continue researches and developments in this field, especially in the area of effective and safe energy uses. From this viewpoint I highly appreciate this prize which was given to the scientists who had greatly contributed to the energy field. 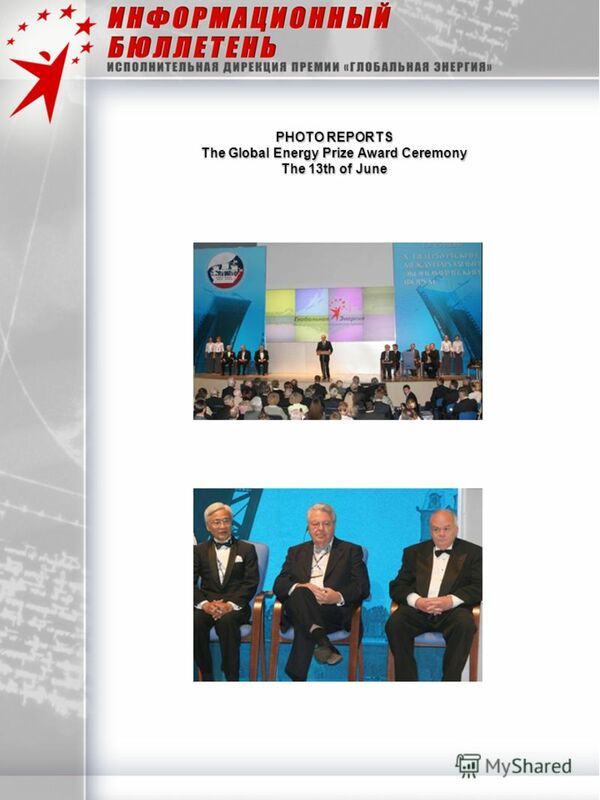 16 I hope that this prize will continue to encourage the researchers to search for new solutions in matters concerning the global energetics.» Due to certain objective circumstances, the RUEM Honorary Chairman, a representative of the Board of Trustees of the Global Energy Prize – Arkady Volsky – did not manage to attend the ceremony. However, he sent his congratulations to the Prize laureates: «… I would like to heartily congratulate the laureates: the member of Academy Evgeniy Velikhov, Doctor Masaji Yoshikawa and Robert Aymar with this high and deserved appreciation and wish them every further success and luck on the path they have chosen. Each of them has all the rights to be proud of his personal input into solving problems that future may hold for our civilisation.» The same evening the Prize laureates, the guests of the ceremony and the participants of the Energetic Forum visited the museum-reserve «Petergoff» where they saw the fountains start-up ceremony and the fancy-dress performance «White Nights Greetings». The spectacular fireworks over the Gulf of Finland marked the end of the day. 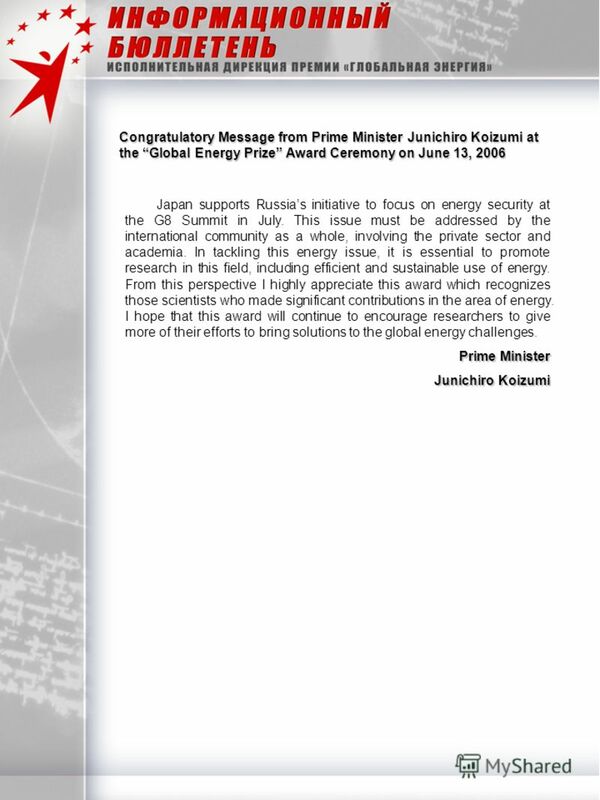 20 Congratulatory Message from Prime Minister of Japan Junichiro Koizumi at the Global Energy Prize Award Ceremony on June 13, 2006 I would like to extend my warmest congratulations to Dr Yoshikawa, Dr Velikhov and Dr Aymar on receiving the International Prize Global Energy for their tremendous contributions to the ITER project since its inception. Recognizing that nuclear fusion promises to be a cleaner alternative energy source for the future generation, Japan has been making considerable efforts to develop ITER with Russia, Euratom and the United States since its beginning in the 1980s. Japan built a world class experimental fusion facility called JT-60 in 1985, well before the ITER programme was launched. We are convinced that the research findings of JT-60 have contributed significantly to the basic design of ITER. Dr Yoshikawa played an essential role in the design, construction and operation of JT-60 in Japan. He has also dedicated himself to the development of the ITER programme in various capacities, such as the Chair of the Management Advisory Committee. I am very pleased that Dr Yoshikawa, Japans leading fusion researcher, is recognized for his outstanding achievements and contributions. Japan is determined to make strenuous efforts to realize ITER with a view to applying nuclear fusion as a practical power source for the future generation. During the construction period of ITER, Japan is going to implement various fusion research projects in collaboration with Euratom that are vital to future nuclear fusion power generation and are intended to complement and promote the ITER project. 22 Dinner at the General Consulate of Japan in St. Petersburg The 14th of June Following the official programme, on the 14th of June at the General Consulate of Japan in St. Petersburg there was a meeting between the Global Energy Prize-2006 laureate Doctor Masaji Yoshikawa, Syrus I.L., a representative of the Global Energy Foundation and Mr. Kidokoro Takyo, Council General of Japan in Russia, Mr. Wataru Ishikawa, Second Secretary of Embassy of Japan in Russia and Mrs. Nobuko Kotani, Attaché of Japan in Russia. 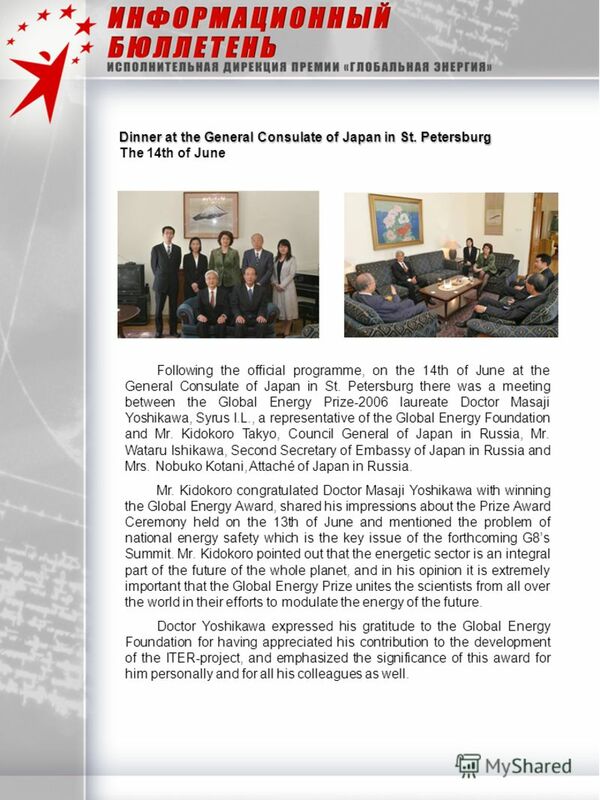 Mr. Kidokoro congratulated Doctor Masaji Yoshikawa with winning the Global Energy Award, shared his impressions about the Prize Award Ceremony held on the 13th of June and mentioned the problem of national energy safety which is the key issue of the forthcoming G8s Summit. Mr. Kidokoro pointed out that the energetic sector is an integral part of the future of the whole planet, and in his opinion it is extremely important that the Global Energy Prize unites the scientists from all over the world in their efforts to modulate the energy of the future. 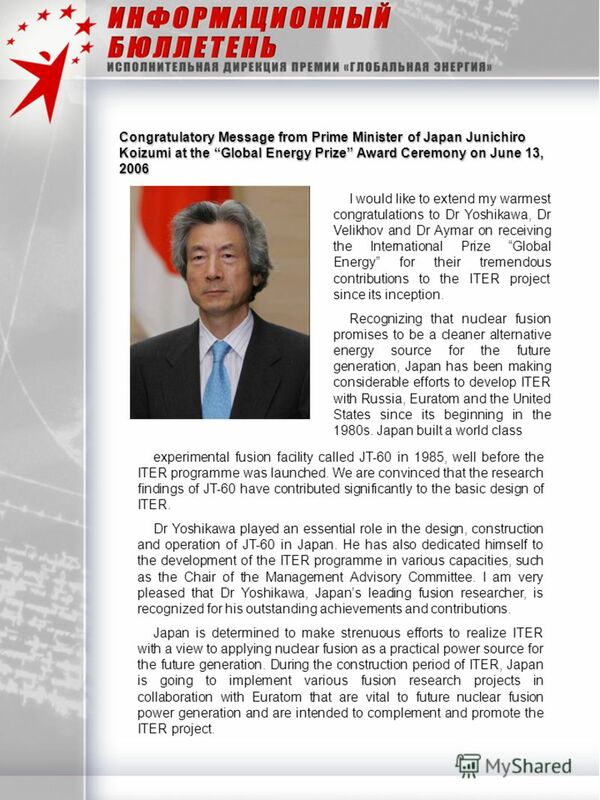 Doctor Yoshikawa expressed his gratitude to the Global Energy Foundation for having appreciated his contribution to the development of the ITER-project, and emphasized the significance of this award for him personally and for all his colleagues as well. 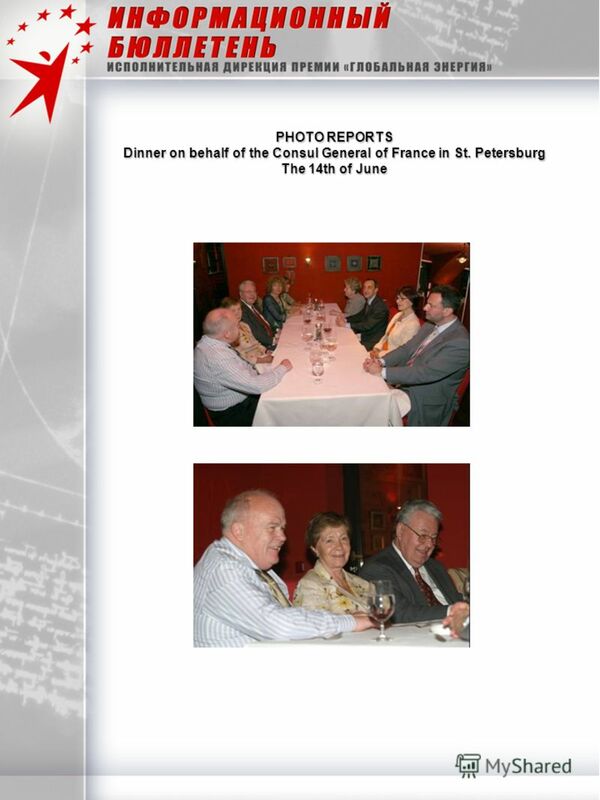 23 Dinner on behalf of the Consul General of France in St. Petersburg The 14th of June Simultaneously with the meeting at the Consulate General of Japan there was a dinner held on behalf of the Consul General of France in St. Petersburg. 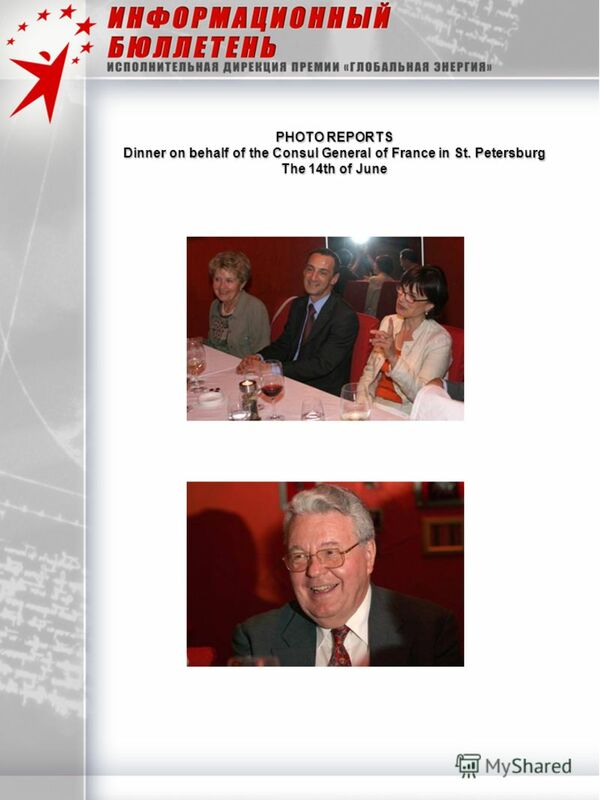 The Prize laureates Evgeniy Velikhov and Robert Aymar accompanied by their wives and members of their families and also Igor Lobovsky, the Prize Executive Director, met Pascal Maubert, General Consul of France in St. Petersburg. The meeting bore an informal character. During the dinner the laureates compared notes about the Prize Award ceremony. The Prize laureates and the guests of the ceremony participated in the round-table talks Energetic Strategies: resources and risks management, the moderators of which were Victor Hkristenko together with Yuri Trutnev. Robert Aymar told that the information he learnt at the round-table was of great value for him as the head of the CERN (European Organization for Nuclear Research). As Evgeniy Velikhov said, he found all the speeches interesting and would have been glad to ask all the participants questions, but, unfortunately, the round-table discussion had exceeded the time limits. The building of the ITER (Thermonuclear Experimental Reactor) in Cadarache was another favourite topic taken up by the participants of the special dinner. 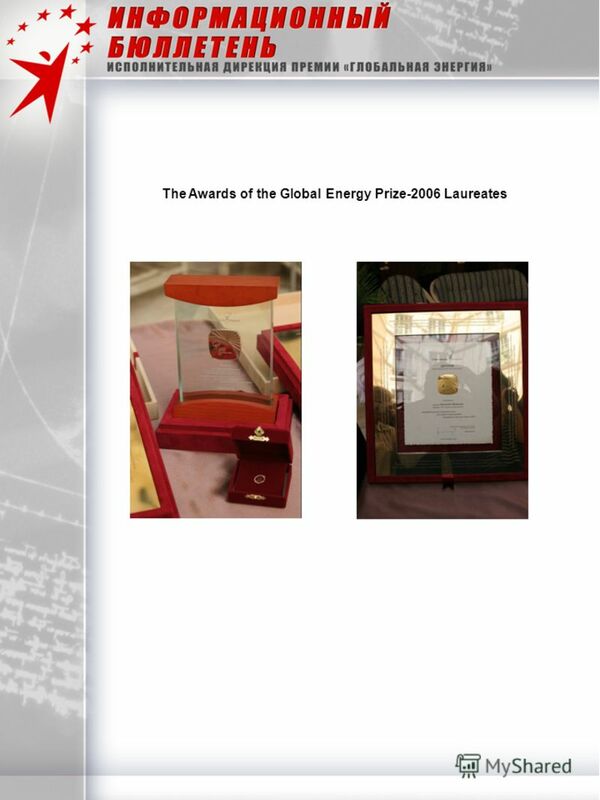 Pascal Maubert emphasized the importance of the Global Energy Prize for developing of the worlds energetic sector, and drew attention to the fact that the ITER-project and the Prize-2006 Laureates were at the threshold of the scientific and technological progress. Thermonuclear reaction was being transmitted from its theoretical stage into practice, and in the future it would provide the manhood with a new source of limitless energy and an opportunity of new discoveries, he said. 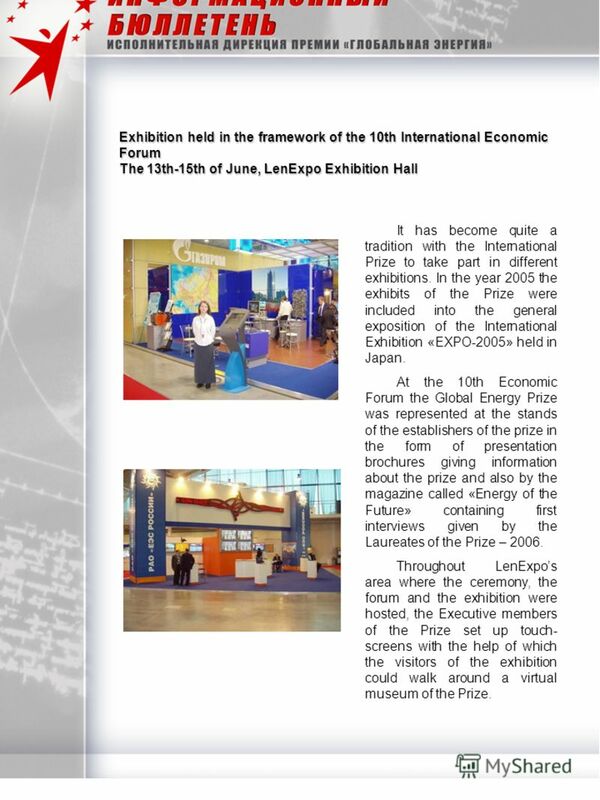 26 Exhibition held in the framework of the 10th International Economic Forum The 13th-15th of June,LenExpo Exhibition Hall The 13th-15th of June, LenExpo Exhibition Hall It has become quite a tradition with the International Prize to take part in different exhibitions. In the year 2005 the exhibits of the Prize were included into the general exposition of the International Exhibition «EXPO-2005» held in Japan. 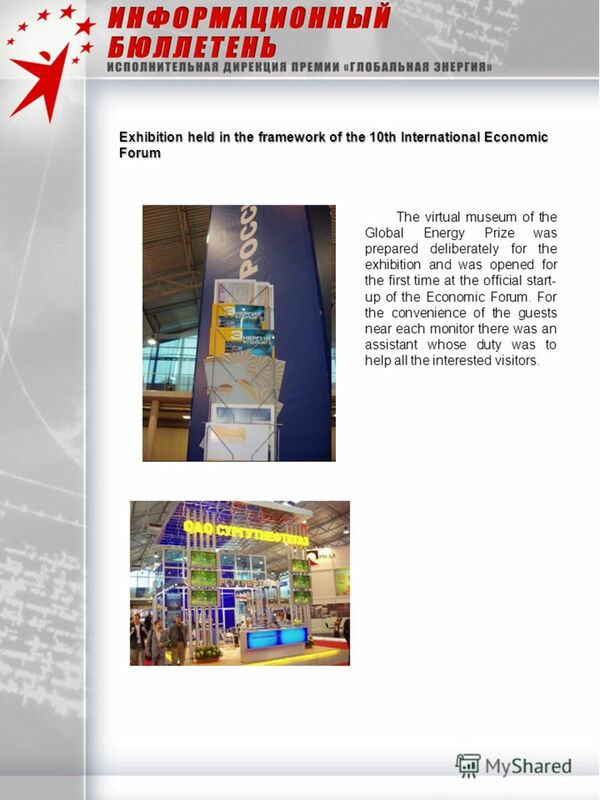 At the 10th Economic Forum the Global Energy Prize was represented at the stands of the establishers of the prize in the form of presentation brochures giving information about the prize and also by the magazine called «Energy of the Future» containing first interviews given by the Laureates of the Prize – Throughout LenExpos area where the ceremony, the forum and the exhibition were hosted, the Executive members of the Prize set up touch- screens with the help of which the visitors of the exhibition could walk around a virtual museum of the Prize. 27 Exhibition held in the framework of the 10th International Economic Forum The virtual museum of the Global Energy Prize was prepared deliberately for the exhibition and was opened for the first time at the official start- up of the Economic Forum. For the convenience of the guests near each monitor there was an assistant whose duty was to help all the interested visitors. 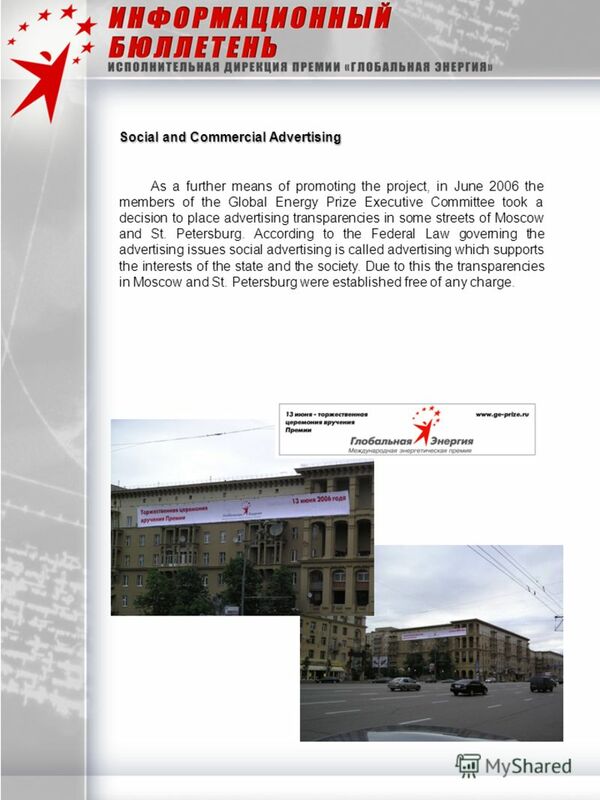 28 Social and Commercial Advertising As a further means of promoting the project, in June 2006 the members of the Global Energy Prize Executive Committee took a decision to place advertising transparencies in some streets of Moscow and St. Petersburg. According to the Federal Law governing the advertising issues social advertising is called advertising which supports the interests of the state and the society. Due to this the transparencies in Moscow and St. Petersburg were established free of any charge. 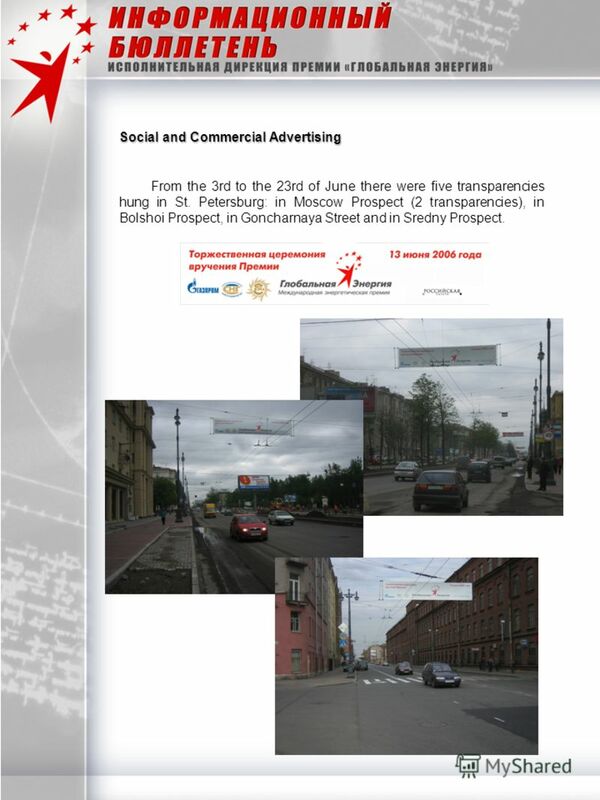 29 Social and Commercial Advertising From the 3rd to the 23rd of June there were five transparencies hung in St. Petersburg: in Moscow Prospect (2 transparencies), in Bolshoi Prospect, in Goncharnaya Street and in Sredny Prospect. 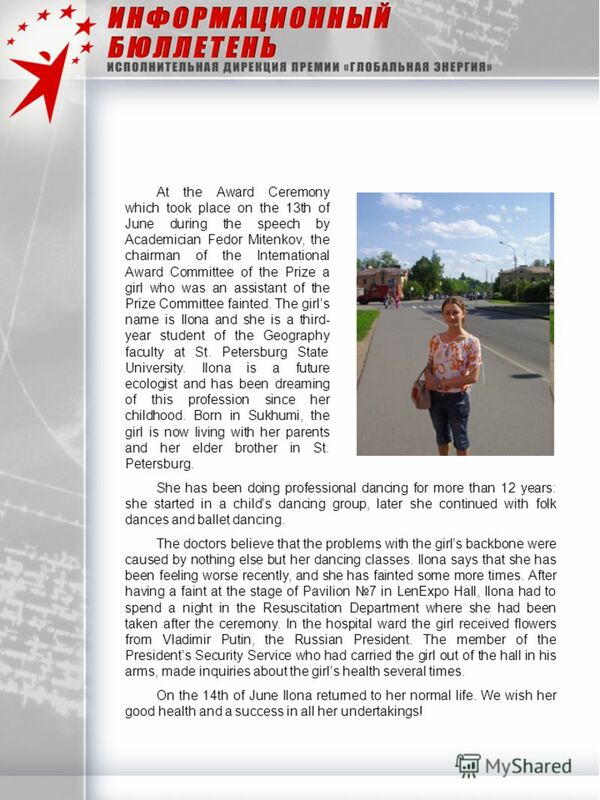 30 At the Award Ceremony which took place on the 13th of June during the speech by Academician Fedor Mitenkov, the chairman of the International Award Committee of the Prize a girl who was an assistant of the Prize Committee fainted. The girls name is Ilona and she is a third- year student of the Geography faculty at St. Petersburg State University. Ilona is a future ecologist and has been dreaming of this profession since her childhood. Born in Sukhumi, the girl is now living with her parents and her elder brother in St. Petersburg. She has been doing professional dancing for more than 12 years: she started in a childs dancing group, later she continued with folk dances and ballet dancing. The doctors believe that the problems with the girls backbone were caused by nothing else but her dancing classes. Ilona says that she has been feeling worse recently, and she has fainted some more times. After having a faint at the stage of Pavilion 7 in LenExpo Hall, Ilona had to spend a night in the Resuscitation Department where she had been taken after the ceremony. In the hospital ward the girl received flowers from Vladimir Putin, the Russian President. The member of the Presidents Security Service who had carried the girl out of the hall in his arms, made inquiries about the girls health several times. On the 14th of June Ilona returned to her normal life. We wish her good health and a success in all her undertakings! 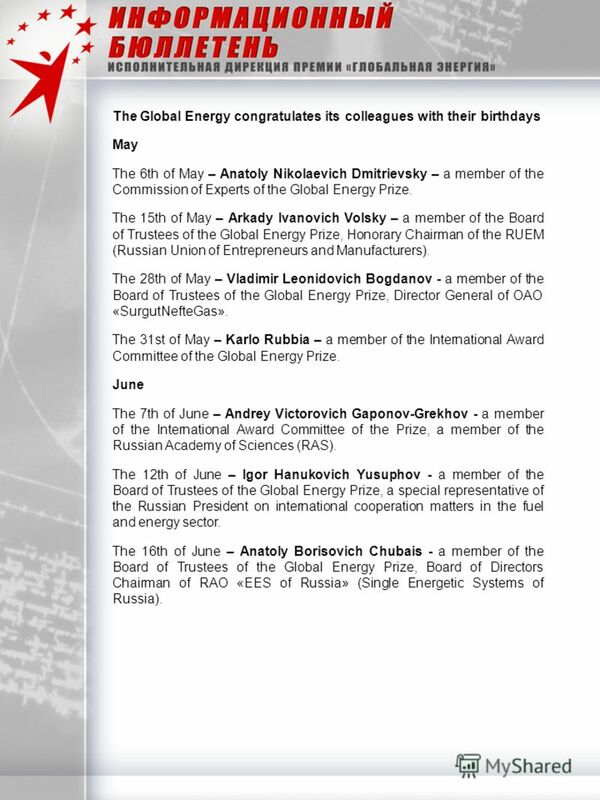 31 The Global Energy congratulates its colleagues with their birthdays May The 6th of May – Anatoly Nikolaevich Dmitrievsky – a member of the Commission of Experts of the Global Energy Prize. 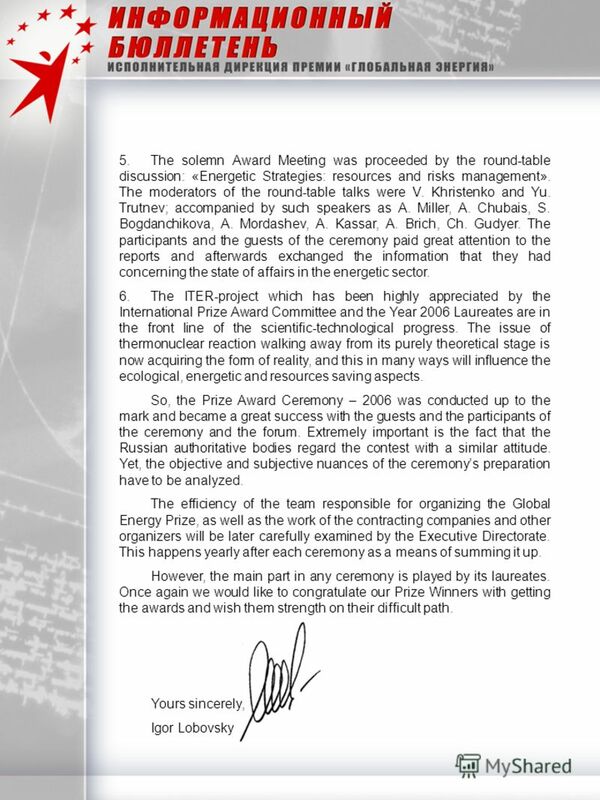 The 15th of May – Arkady Ivanovich Volsky – a member of the Board of Trustees of the Global Energy Prize, Honorary Chairman of the RUEM (Russian Union of Entrepreneurs and Manufacturers). 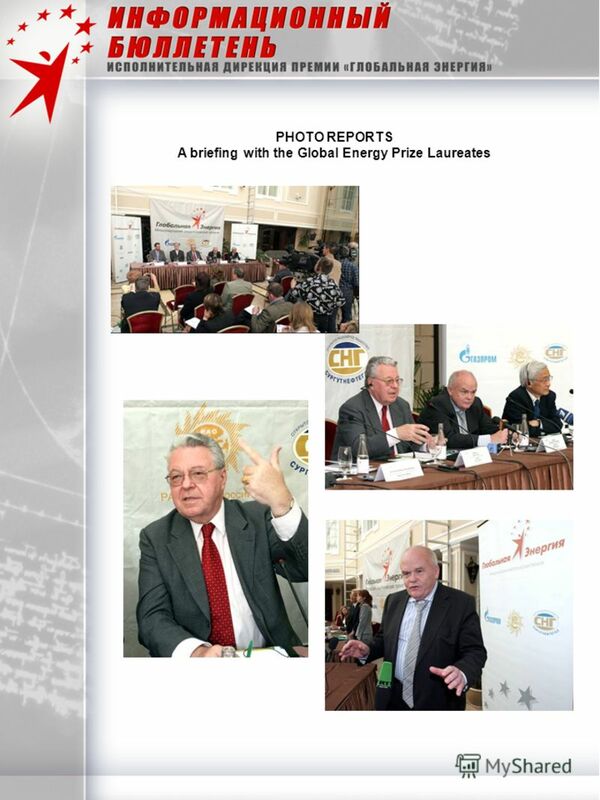 The 28th of May – Vladimir Leonidovich Bogdanov - a member of the Board of Trustees of the Global Energy Prize, Director General of OAO «SurgutNefteGas». The 31st of May – Karlo Rubbia – a member of the International Award Committee of the Global Energy Prize. June The 7th of June – Andrey Victorovich Gaponov-Grekhov - a member of the International Award Committee of the Prize, a member of the Russian Academy of Sciences (RAS). 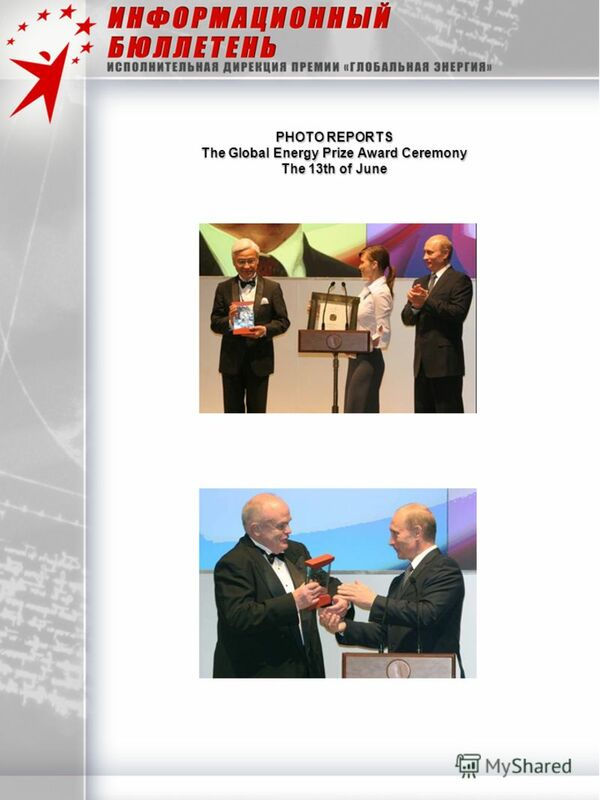 The 12th of June – Igor Hanukovich Yusuphov - a member of the Board of Trustees of the Global Energy Prize, a special representative of the Russian President on international cooperation matters in the fuel and energy sector. 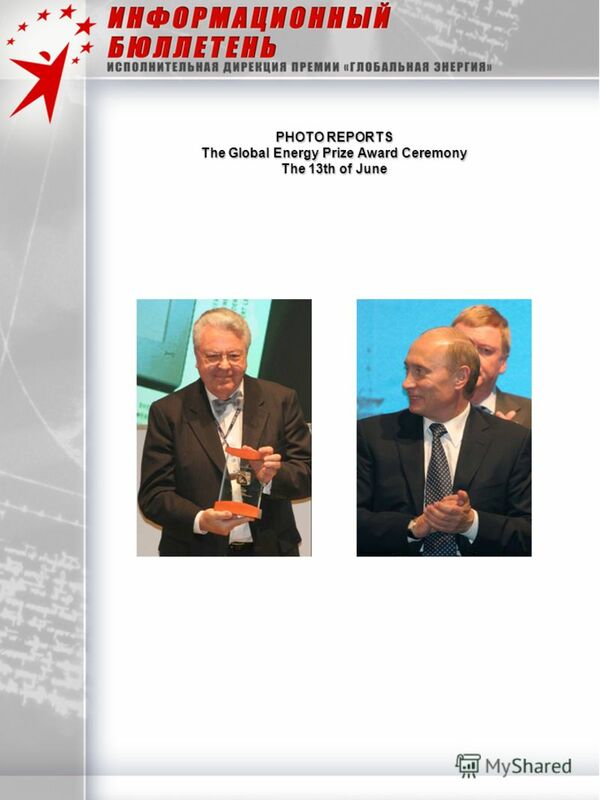 The 16th of June – Anatoly Borisovich Chubais - a member of the Board of Trustees of the Global Energy Prize, Board of Directors Chairman of RAO «EES of Russia» (Single Energetic Systems of Russia). I.P. Pavlov is one of the greatest physiologists in the world. To start with, choosing a future profession is one of the most important decisions in our life. A person passes almost half of her/his life at work. There. According to the reporters research, the logistics industry is currently facing some problems such as capacity, infrastructure, security, rising truck. The American system of school education differs from the systems in other countries. There are state public schools, private elementary schools and private. Factors that Influence the Popularity of Artists The project work by Koryakova Anastasia, School 70 10B form Supervisor: Shumanskaya Elena Borisovna.